Given that we are a finance couple’s site, we are big advocates for getting your finances in line before you consider walking down the aisle. With our unique story, we negotiated how to divvy up our finances long before we got to discussions about marriage and it has been a fluid process since the beginning. We believe that it is in everyone’s best interest to establish a prenuptial agreement and continue to revise nuptial agreements throughout one’s relationship. What to Do Before “I do” is an excellent resource for considering the advantages for your circumstances. 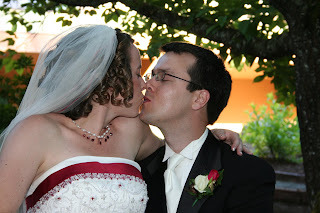 We also were strongly in favor of paying for our wedding ourselves, and saving to do so. Here are a couple of different posts on saving for our wedding. While you can check out our goals page to look at more tips to save for goals, we also found that keeping track of our wedding savings was very helpful to us. Of course there are always some wedding tribulations. Also keep in mind that previous savings methods from paying off credit cards was helpful in transitioning to saving for our wedding. Even before our wedding occured we were considering what our next goals were after we were married. You can also check out what our net worth looked like as we were getting ready for our wedding. Finances can always be emotionally driving, but this is particularly the case when paying for a wedding. Talk to any bride and she’ll tell you about the fabulousness of theknot.com, a great all around resource during wedding planning. They also have a great sister site after the wedding, called thenest.com. We also love finding ways to save on weddings. We headed out to Oregon and had several posts from there updating on our wedding progress: I, II & III. There are also reflections on our big day from James and Miel, plus keep in mind that it is well worth it to play the honeymoon card. It is also excellent to keep these registry tips in mind. On the flip side you can check out Hollywood wedding glitz. While these resources are good for couples at any level, we particularly think that the values circle exercise by David Bach is well worth taking the time to go through. We’ve also looked at the touchy topic of wealth and marriage. We DINKs believe in equal rights. That includes the right to marry, no matter what gender. Also keep in mind the cost of discrimination that comes from preventing marriage equality. We were also very fortunate to fall on prosperous times during our wedding and honeymoon. We also played the honeymoon card all the way to Thailand and scored big time! Upgrades to first class and suites! Readers: We’d love to hear from those planning weddings!